Little Sheriff Baby In Orange Park Florida - Newborn Photography | Schedule Your Newborn Shoot Today! Incorporating mom or dads profession into their newborn photos is something we do here often at the photography studio in Jacksonville. Whether it's for nurses, teachers, fire fighters, or police officers there are so many unique ways to create a profession themed newborn photo. 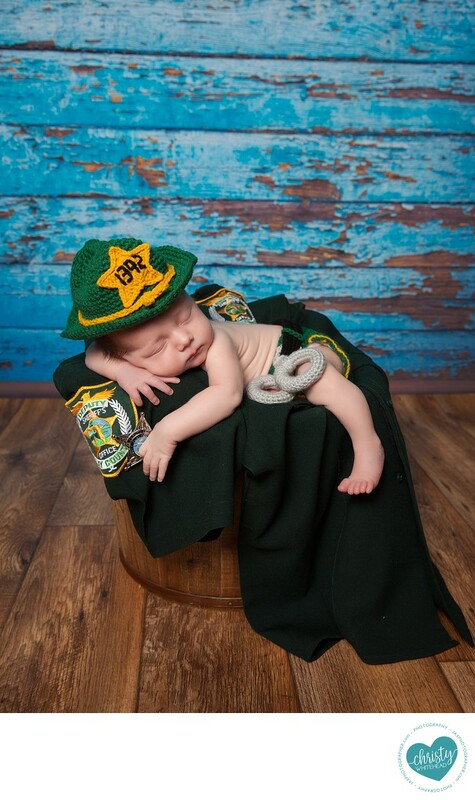 This little guy's daddy works for the Clay County Sheriff's Office so he brought in a part of his uniform to photograph his newborn son with. The parent's brought in the matching crochet outfit with the cutest crochet hand cuffs to fit the theme. We also keep a variety of props, costumes and outfits here at the studio to create custom newborn sessions for our clients. This little guy slept through the entire thing (which made my job easier) and posed like a champ. Who knows, maybe he will follow in his daddies law enforcement foot steps one day? Although, for right now, I think he's just focused on sleeping and eating as much as possible. The photo turned out so adorable that his mom and dad ordered it on a large canvas wrap. Our goal for every newborn photo shoot is to provide images that you want to display on your walls long after your children have grown up. Let's chat about how we can create a custom session for you!